Somehow, legislative leaders remain under the false notion that they have fully funded the 2018-19 K-3 class-size requirements. Recently, Sen. Phil Berger has claimed that since 2014, local school districts have received roughly $222 million to lower class sizes, and that this additional investment is sufficient to meet next year’s smaller class sizes. Senator Berger is very wrong. 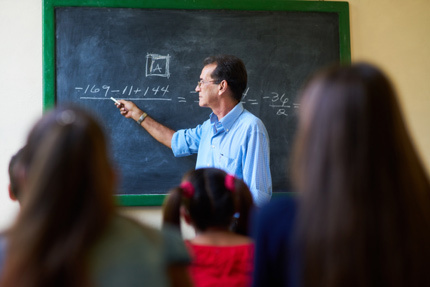 Additional funding from the legislature has allowed North Carolina school districts to hire an additional 1,966.5 teachers, as compared to the 2013-14 school year. However, as compared to the 2013-14 school year, the new class-size requirements necessitate the hiring of 6,678.5 additional teachers. There remains an unfunded gap of 4,712 teachers, or approximately $304 million. The funds mentioned by Sen. Berger have nothing to do with meeting next year’s change in class sizes. The citation of these figures is a poor attempt to distract from the fact that next year’s class-size mandate remains unfunded. The resources below allow anyone (even a General Assembly member) to do the math themselves to see the extent to which the FY 2018-19 class-size mandate remains unfunded. North Carolina funds its teachers via a dedicated stream of funding called the classroom teacher allotment. Since 1985, this allotment has been designed to provide districts with funding for both “regular” classroom teachers as well as “enhancement” teachers – those who teach courses such as art, music, and physical education. Maximum individual class size: The maximum number of students for an any individual classroom. Historically, the district class-size average has exceeded the allotment ratio by three students, and the maximum individual class size has exceeded the allotment ratio by six students. This flexibility allows districts to hire enhancement teachers and also accounts for the fact that students do not come in neat bundles that correspond to required class sizes. The example below shows how this works in a situation in which the kindergarten allotment ratio is 1:18, the district class-size average is 1:21, and the maximum individual class size is 1:24. A North Carolina district with 252 kindergarten students would receive guaranteed funding for 14 teachers. However, it only requires 12 teachers to maintain a district average class size of 21 students. Existing flexibility could allow this district the option of hiring two enhancement teachers (e.g., an art teacher and a PE teacher) and 12 kindergarten teachers. At the same time, this district could use its flexibility to provide targeted class-size reduction for at-risk students. Our example school district could use its flexibility to have eight classrooms with 24 students, and four classrooms with just 15 students. For thirty years, this system of funding both “regular” and “enhancement” teachers via one allotment has worked well for North Carolina districts and students, and has been understood by legislators. It appears, however, that the current General Assembly leadership is unable or unwilling to understand how this system works. When legislators are exploring options to change class sizes, staff at DPI and the General Assembly’s nonpartisan Fiscal Research Division use a spreadsheet called the “class-size calculator” to determine the cost. A copy of the class-size calculator can be found here. As shown below, the calculator looks at the allotment ratio in each grade span to calculate how many teachers would be provided to each district, based on each district’s number of students in that grade span. The calculator compares the number of teachers provided under the current allotment ratio (black numbers) against the number of teachers provided under any proposed allotment ratio (red numbers). The difference is then multiplied by the average salary and benefits for a teacher position ($64,558 for FY 17-18). Over the last four years, the General Assembly has reduced the allotment ratios (i.e., increased funding) in grades K-3. As shown above, the allotment ratios in grades K-3 were reduced by one student beginning in FY 2014-15. The grade 1 allotment ratio was decreased by an additional student in FY 2016-17. The specific annual cost of these allotment ratio changes vary from year-to-year, as the number of students in these grade spans change, as does the average salaries and benefits of a classroom teacher. However, we can use the class-size calculator to determine the current-year cost of moving from the FY 2013-14 allotment ratios to the FY 2017-18 allotment ratios. If we set the “current span” (black numbers) at the FY 2013-14 ratios, and set the “proposed span” (red numbers) at the FY 2017-18 ratios, the class-size calculator will tell us two important data points: the additional number of teachers provided in the current year due to the change in allotment ratios from FY 2013-14 to FY 2017-18, and the current-year cost of providing those additional teachers. As shown below, the allotment ratio changes from FY 2013-14 to FY 2017-18 are currently providing school districts with an additional 1,966.5 teaching positions, at a current cost of approximately $127 million. Why is Senator Berger claiming the General Assembly has provided an additional $222 million? Senator Berger doesn’t know how to properly read a budget. To arrive at the $222 million figure, Senator Berger is looking at figures provided for additional teachers in the 2014 budget bill and the 2015 budget bill. The committee report to the 2014 budget bill shows that the General Assembly increased funding for teachers in FY 2014-15 by $42 million. The committee report for the 2015 budget bill shows that the General Assembly increased funding for teachers in FY 2016-17 by an additional $27 million. To arrive at the $222 million figure, Senator Berger multiplies the $42 million by the four years this funding has been provided, and multiplies the $27 million by the two years this funding has been provided. If these figures are summed, one can make the claim that the General Assembly has provided schools with an additional $222 million of funding in recent years that can be used to lower class sizes. Senator Berger is actually selling the General Assembly short. His calculations fail to note that part of the 2014-15 class-size decrease was funded via the 2013 budget bill. It’s a bit complicated because the FY 2014-15 funding provided in the 2013 budget bill was provided after the 2013 budget drastically cut teacher funding for FY 2013-14. 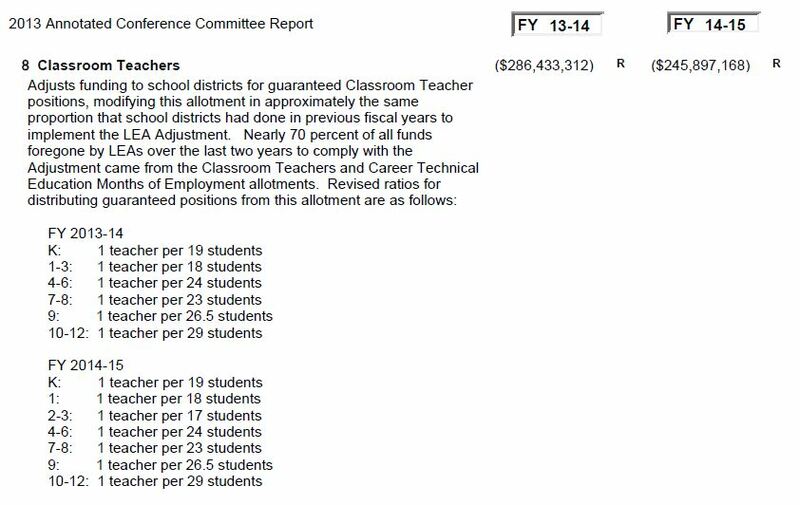 But if you are interested in the additional classroom teacher funding provided since the General Assembly began reducing K-3 allotment ratios, you also need to consider the $40.5 million difference between the FY 2013-14 and FY 2014-15 budget reductions. As shown below, the actual cumulative investment in classroom teachers since FY 2013-14 is closer to $384 million. Of course, these cumulative figures are slightly inaccurate, and quite misleading. First, the state provides districts with additional positions, not dollars. As mentioned above, the number of positions changes from year-to-year based on the student enrollment figures. The dollar value of each position also changes from year-to-year due to changes in the teacher salary schedule and the cost of benefits. The figure is misleading because most readers don’t realize that Senator Berger is referring to funding provided over a four-year period. Most readers would assume that Senator Berger is using the normal convention when talking about budget figures: expressing budget figures in current-year dollars. Even though Senator Berger has flubbed his calculations, his use of cumulative figures leaves readers under the impression that the General Assembly has increased funding to a much greater extent than it actually has. As explained above, the actual current-year cost of the General Assembly’s increased spending on teachers is actually $127 million. How does the money provided from FY 2013-14 to FY 2017-18 help districts meet lower class sizes in FY 2018-19? The additional teacher funding provided from FY 2013-14 to FY 2017-18 does nothing to help school districts fund the change in class size requirements that will go into effect in FY 2018-19. As shown above, the additional teacher funding provided from FY 2013-14 to FY 2017-18 has only helped fund the change in class size requirements between FY 2013-14 and FY 2017-18. In the next school year, districts are being forced to meet tighter class size requirements without additional funding. Next school year, the General Assembly proposes to eliminate the three-student cushion between the teacher allotment ratio and the district class size average. As explained above, the cushion is what allows districts to hire enhancement teachers. By eliminating this cushion, the General Assembly is mandating that no funds from the classroom teacher allotment can be used on enhancement teachers. Of course, arts and physical education are both required under the North Carolina Basic Education Program. Therefore, districts cannot meet the current class size mandates without additional funding. Despite what they claim to the press and their constituents, the General Assembly has admitted it has failed to fund required K-3 class sizes. Following the passage of this year’s budget, General Assembly leaders passed a “technical corrections” bill. The bill includes language admitting to their failure to fund next year’s class-size mandate, saying that it is the General Assembly’s “intent” to provide the funding at some point in the future. How much additional funding is required to meet the FY 18-19 class-size requirements? Current levels of funding are $304 million short of funding the FY 2018-19 class-size requirements. To determine this, we once again return to the class-size calculator. Historically, there has been a three-student cushion between the allotment ratio and the district class-size average. For much of this century, the allotment ratio for grades K-3 has been 1:18, with a district class-size average of 1:21. At these ratios, the district is able to generate one enhancement teacher for every six “regular” classroom teachers. As the allotment ratio is decreased, the three-student cushion generates an increasing number of enhancement teachers for every regular classroom teacher. As a result, it is more important to maintain the percentage difference between the allotment ratio and district class-size average, rather than maintaining a fixed number of students. In order to continue funding for enhancement teachers and still meet FY 2018-19 class-size goals, the allotment ratios would need to be approximately 86 percent of the required district class-size average. We now plug these new allotment ratios into the class-size calculator to determine how many additional teaching positions and how much additional funding is required to meet next year’s class-size requirement. These allotment ratios show that current funding is 4,712 teachers, or $304 million, short of fully funding next year’s class-size requirements. Would an appropriation of $304 million take care of everything? Of course, the calculations above only show the General Assembly’s current shortfall in the funding of teacher positions. This analysis does not include any estimate of the additional capital costs associated with smaller class sizes. Even if the General Assembly were to commit to fully funding next year’s class-size requirement, it would be best serve by phasing the requirements in over several years, and providing additional capital support to school districts. North Carolina school districts already have at least $8.1 billion of facility needs. The combined operating and capital expenses make lowering class sizes an incredibly expensive intervention. But a phased-in approach with fully-funded capital needs is the only way to ensure the General Assembly’s self-professed goals of lower class sizes with students in high-quality learning environments. Given that the General Assembly is unwilling to follow a fully-funded, phased-in approach, and that these funds would probably provide greater return on investment if used for alternative interventions, the best option is to repeal next year’s class-size requirements, allowing the district average class-size to once again exceed the allotment ratio by three students. The recently-introduced SB 703 does just that, ensuring full funding of enhancement courses, and aligning class-size requirements to current funding levels. Of course, such courses are central to a well-rounded education and required by state law. It is important to note that DPI has not yet calculated FY 18-19 ADM by grade level for each district. As a result, this analysis uses FY 17-18 ADM figures. Actual costs for FY 18-19 will differ somewhat from this analysis due to enrollment changes. It is important to note that until this year, General Assembly laws allowed school districts to deploy these additional teacher positions across any grade level. These 2013 budget cuts to the teacher allotment allowed the General Assembly to eliminate what was known as the “negative reserve” or “LEA Adjustment.” The LEA Adjustment required each district to identify a series of discretionary budget cuts. The 2013 budget maneuver essentially replaced the discretionary budget cuts with directed cuts to the classroom teacher, instructional support, and instructional supplies line items. I am no fan of Progressive Pulse but this is a much needed laying out of the current situation. Why the bigger media outlets don’t do something like this is a tragedy. It’s the presentation of actual facts like this that force politicians to hide for fear of being shown up, change their positions, or reveal their true and different motives.